In 1935 at the meeting of the International Federation of Philately (FIP) in Brussels it was proposed that a Stamp Day be created. The idea being that each country that was a member of the FIP issue their own unique stamp on a certain day of the year. The project was approved, but it wasn't until 1944 that the first stamps for Stamp Day were issued. 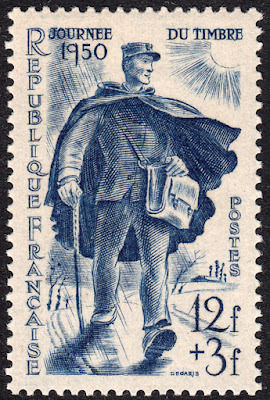 In 1950, Albert Decaris designed and engraved France's Stamp Day issue. The stamp was released for sale on 11 March. The face value was 12f with a 3f surcharge that went to the French Red Cross. If this stamp doesn't make one wish to be a postman, I don't think anything will. Decaris has engraved this postman, in my eyes at least, as some kind of superhero. The flowing cape and the powerful stride combine to suggest this postman is eating up the miles on a quest to deliver his mail in record time. I rather like this design. It is whimsical, bright, and contains a sense of adventure. Now, how does one become a postman? !